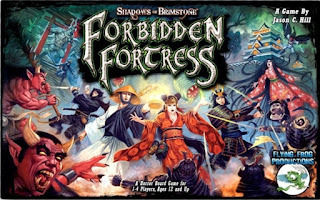 Still no "Forbidden Fortress" game report I'm afraid, but here's a quick round up of what I have managed hobby-wise since the last post! First off, here's a contingent of the Ii clan on the march to support their allies the Takeda (you may remember that the Takeda clan were having a tough time of it in the Test Of Honour clashes with the Mori clan). The Ii were well known for their red armour - intended to intimidate their opponents, but also making the ideal subject for what's been a 'speed painting' exercise!! The trees they're marching past are also a new addition. I'd seen someone using cheap trees from China and thought I'd give them a try, basing them up on mdf scatter bases I had to hand. At £5.85 including postage for TEN trees I think they're an absolute bargain. Now, talking of speed painting, I've acquired a few minis from Greenbriar Games "Folklore: The Affliction" game, and two ghostly types only needed a prime and a wash to make them 'table ready'. 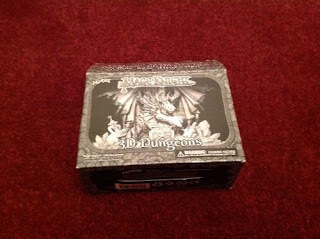 I'm going to stray from gaming now, and mention my "other hobby", which has taken very much a back seat since I succumbed to the siren call of the Dice Gods once more. Because of the dry sunny weather and time of year, my services have been required out in the garden, and oh dear, my narrow gauge model railway is showing severe signs of neglect! It puts me in mind of the state of the Tallyllyn when it was 'discovered' after years of closure by Tom Rolt (sparking the whole concept of Railway Preservation), and even though it's not been touched in months I thought it looked kind of photogenic. or maybe I'll try and photograph the "volounteers" as they set about restoring the railway!! And that's about it for this post, other than to thank you for visiting, and inviting your comments which as ever would be most welcome. Steady progress on the painting desk since the last post, with more additions to the oriental collection. Someone's in trouble - the Sohei, or Buddhist warrior monks are armed and making their way down from the temple! These are AW Miniatures, led by Masahiro from the Warlord Games "Masked Men" box set for Test Of Honour. A Bakemono (goblin) warband led by a large Dai-Bakemono on a village raid - could these be the reason the Sohei are on the march? The Bakemono are by Dixon Miniatures and I believe the leader is on old Oni from Citadel Miniatures (please correct me if I'm wrong). Before anyone says "Bakemono aren't green", this warband has been put together to try and tempt an opponent into a game - he's previously only played Warhammer, so I thought greenskins would help win him over! The spirits of the Yurei (ghosts) have risen from their graves - a portent of things to come? These are "Chinese Ghosts" from Black Hat Miniatures old Tales of the Dragon Kings range, but fit the bill in my humble opinion. It's been a very busy week non-hobby wise but I've managed to acquire a new van, transfer the "mod cons" (carpet, bed, sink and cooker) and sell on the old van to its new owner! The process took about three weeks last time, so I'm well chuffed!! Many thanks once again for visiting, the samurai bias is set to continue for a while yet, but I'm feeling the urge to visit one of the other projects by way of a short break / diversion so if "Nippon" isn't your thing just hang in there! Your comments, criticism or questions are most welcome - especially if you can help me identify the leader of the bakemono gang. I really should have looked at the bottom of his base before gluing him to that circle of mdf and painting him!!! 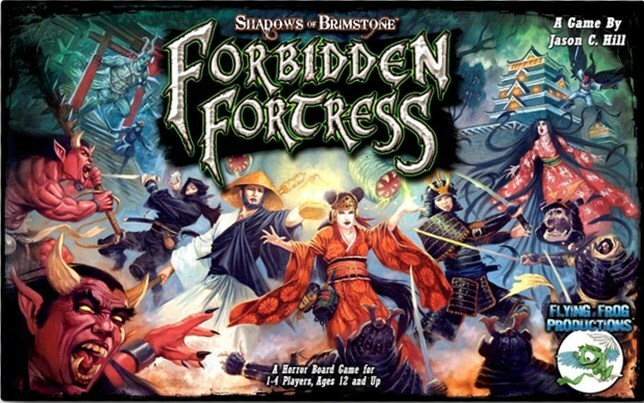 of The Forbidden Fortress core set. Despite it being "Birthday Week" - my own and the financial dictator's are six days apart, so we have an extended annual bash, it's also been fairly busy work-wise, but thankfully I've still managed to get the beasties for Forbidden Fortress painted up and ready to use. First up are the Acidic Tentacles. These belong to a huge beast that lives beneath the floor of the fortress and are capable of bursting up to attack the heroes at any time! Next are the Dishonoured Dead - the skeletal remains of the fortresses mortal defenders who fell foul of The Darkness, and now reanimated to serve a new, foul, master. The Tengu are the first of the truly "mono pose" mini's. That minor gripe aside, I do like these creatures and their ability to fly over any obstacles in the fortress will probably make them a dangerous foe! More mono pose, this time in the shape of three large Oni, evil demons now serving The Darkness. while one of the smallest (yet possibly most dangerous) is the ghostly Harionago, levitating while her long barbed hair weaves about her, ready to impale any of the heroes who might get too close! As with the heroes, I've painted all the bases plain black as per the illustrations in the painting guide, but intend re-visiting them as soon as I come up with a plan that will make them look OK on both the game tiles and the table top. 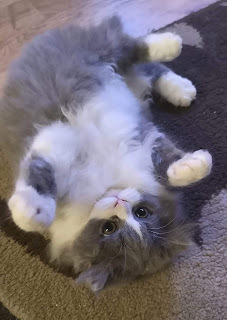 Short and sweet progress report, but a post is a post. As ever, many thanks for dropping by and any C&C's are more than welcome in the comments section. There has been no contact from a local fortress belonging to an allied samurai clan. Fearing the worst, Matsushita Akitane has sent one of his most loyal warriors to discover the fate of their brothers in arms. and the following morning, shugenja Azai Komako is traveling to the fortress in search of her master, who was due back from there two days ago, the old wizard is so punctual that she just knows something is wrong! The four heroes from the box set are painted and on their way to the Forbidden Fortress. Their bases are plain black at the moment which is fine for use with the floor tiles, but the plan is to use them for table top games as well so I need to texture them in some way that they'll be compatible for both. The "monsters" are on the bench and progressing through the paint queue, and the sharp eyed among you will have noticed some additions to the oriental terrain collection. Many thanks for reading, and your comments,critiques and questions are more than welcome - no predictions about the next post (I'm still convinced my blog is under a curse! ), but I'd like to get the monsters finished so that I can play my first game, and of course clear the bench to crack on with other projects. It might be the shortest month of the year, but this one's been a real drag and I'm glad to see the back of it!! Anyhow, the lesson I've learned from the experience is to give up making predictions about what and when specific topics will be appearing here on the blog - it seems that every time I do, something crops up to scupper my plans....... cause and effect?!?! 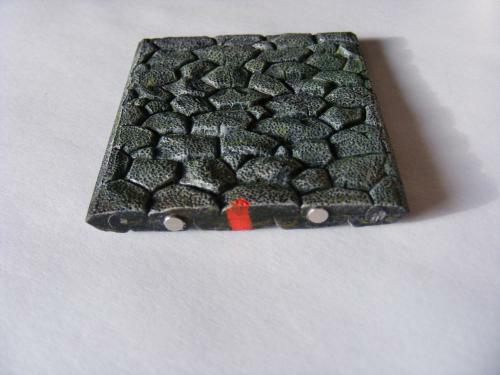 Anyhow, first off you'd better say hello to our new addition "Arwen"
and here's its corresponding tile. The artwork on all of the tiles is equally impressive, and all of them are double-sided, printed on good quality card. So, "Farewell February" and March is already looking better - 'retail therapy' (as well as a meet-up with fellow blogger Vagabond) at the Hammerhead show in Newark is this Saturday! 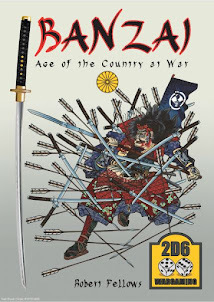 "A fast paced, co-operative (or solo), dungeon crawl boardgame set in war torn Feudal Japan"
Once I'd read more info on the game, plus watching reviews and "unboxing" vids on youtube, I set about finding the best UK price for a copy, then sat back and awaited the arrival of the (big) box. When it did, I was amazed by the weight! Forbidden Fortress is packed with double sided floor plans, card decks, counters, dice, rule and scenario books - even a soundtrack cd!! I've managed to assemble them all and they're presented below with an AW Miniatures 28mm samurai for size comparison. The minis do come with their own bases, but since I intend using them in table top games as well as the boxed rpg, I've substituted standard mdf bases appropriately sized to match the rest of my Sengoku period collection. Last but by no means least, the Harionago, levitating while her animated hair with its barbed tips coils menacingly around her. The background narrative to the boardgame provides a perfect setting for some fantasy table top games based on this genre, so I'd better get cracking with the painting. Sorry I'm a bit late with this post, I still feel like I should be hibernating, but am happy to report that I can sense the sap rising and regular blogging should resume henceforth. Thanks for visiting and as always your comments and questions are very welcome! First post for 2019, but it features a game we played in 2018 (during the Christmas hols), and is actually continuing an adventure that 'paused' in 2017! 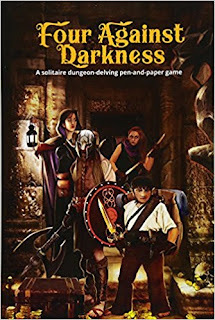 My "Dark Conspiracy" fantasy campaign started life based around Bluebook D&D for adventures and third edition Warhammer for battles, and was deliberately 'rules lite' for the benefit of the not-too-serious gamers in the little social group. 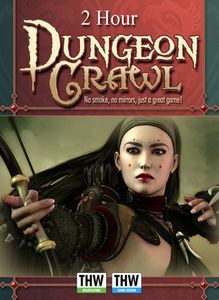 Dragon Rampant has since replaced Warhammer to provide the campaign battle results, and this game was a test to see if I can use an alternative set of 'dungeon crawler' rules so the campaign can speed up by continuing solo - over a year between episodes is just a little TOO slow! The Story So Far....The party had been tasked by the Court Mage Nicodemus to recover an artifact (a metal cylinder containing the last breath of Maeldoraz) to prevent any attempt to revive the arch-necromancer. with no signs of another exit, and worse still, no sign of the cylinder! WARNING What follows isn't a complete AAR. Since I was playing "away from home" I didn't have all of my accessories, set dressings etc to really make the game worthy of presentation - it's here in context of the rules change, and a mere 'taster' of what's to come. a small room obviously occupied by the warden who had trapped them down here. After some deliberation, they decided to see what would happen if the stones were placed in the eye sockets of the carved skull. The idea proved to be right, as a portal materialized in front of them. After examining the portal as best they could (throwing a stone into it! ), Pendora mustered her faith and led the party into the unknown. Up to this point, everything had been previously scripted by myself while creating the dungeon to run as DM for the group. From here, I let "Four Against Darkness" take over. 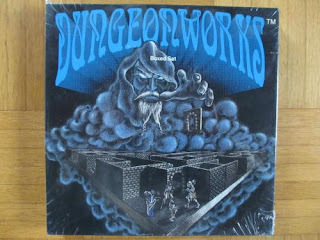 The system generated the dungeon and its contents, which I simply "narrated" for the group while I took it for a test drive. Stepping through the portal, the group found themselves in another chamber with nothing but a single closed door. Happy to be out of room they'd been trapped in, they now set about where they actually were. The exit opened into a corridor, with another door diagonally opposite. No one was keen to open the chest and risk setting off another trap, the party deciding it was better to first explore their surroundings and then return to this room later if they got the chance (and also regretted not bringing along a Thief character!). where they encountered an ogre! and the ensuing melee went well - both for the party and as far as my 'trial' of the rules, since I wasn't looking forward to swapping the polyhedral dice (SO D&D) for simple D6's, but was pleasantly surprised with how well the system works. Finding nothing of value in the room, the party chose one of the two exits and headed further into the dungeon, arriving at a four-way junction where they were confronted by some nasty looking huge rats. The rats were obviously unhappy about the nasty looking adventurers which had appeared, because they fled and left the junction clear. ....and a HUGE scrap ensued! Once again, I was more than happy with how the system handled the melee, so "Four Against Darkness" (4AD) received another tick-in-the-box from me. Goblins might be a bit stupid, but 4AD certainly isn't, and the system worked wonderfully again as the gobbo's broke and fled. The goblin's escape route went up a flight of stairs, so could possibly lead towards an exit, but at this point the adventurers decided to head back to the room containing the chest - the thought that it might contain the cylinder if it had been taken through the portal for hiding had been nagging them. Before they could find out though, they had to get past a Carrion Crawler which was prowling the corridors looking for a meal! And at this point I'm going to break off from the tale - as I said at the start, this post was never intended to be a "narrative AAR" (and since it was very much a 'beer & pretzels' session the photo's got much worse from this point onwards! 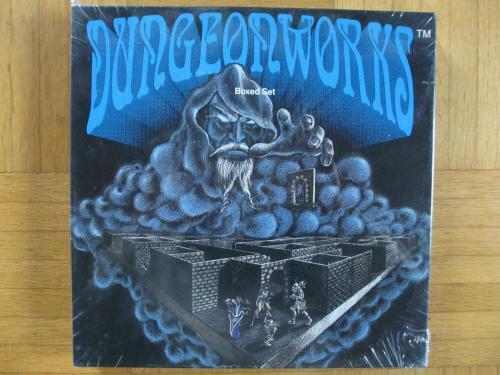 ), but a general overview of how I'm running my dungeon adventures, and as well as a mention of the rules, I'd like to showcase how I represent the game on the table. 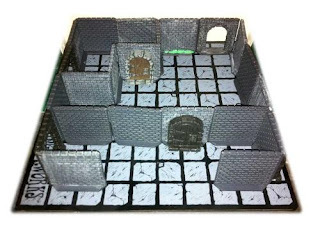 As much as I'm a big fan of the eye candy that some players produce using products like Dwarven Forge to lay out table-spanning dungeons, I've always DM'd by only presenting the players with what they can "see" on the table top - taking it up as they progress and forcing them to memorise / map or run the real risk of getting lost. This is really easy when using a 2 dimensional tile system, but creates a bit of a challenge in 3D. so I decided to cut off the pegs (which were prone to snapping off anyway!) and replaced them with tiny magnets which I glued into holes I'd drilled out for the purpose. I bought one of those "magnetic" notice boards from Wilkos and covered it with printed 'dungeon tiles' from Fat Dragon Games and simply set up the dungeon areas with a selection of wall and door sections - here's how the ogre encounter above was done. 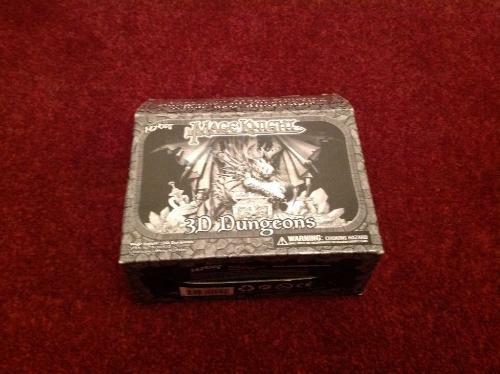 I loved the "Old Skool" look of the artwork, and the guy was selling two sets worth of bits in one box at a great price, so I bolstered my dungeon with them - even though I'm not overly keen on the bases of the dungeon sections! and will feature it in a future post. In the meantime though, a belated Christmas present has just arrived and I'm itching to get it opened!! Suffice to say that it will be the topic of conversation for the next entry on the blog! Thanks for visiting, and as ever your comments, questions, suggestions or criticisms are more than welcome.